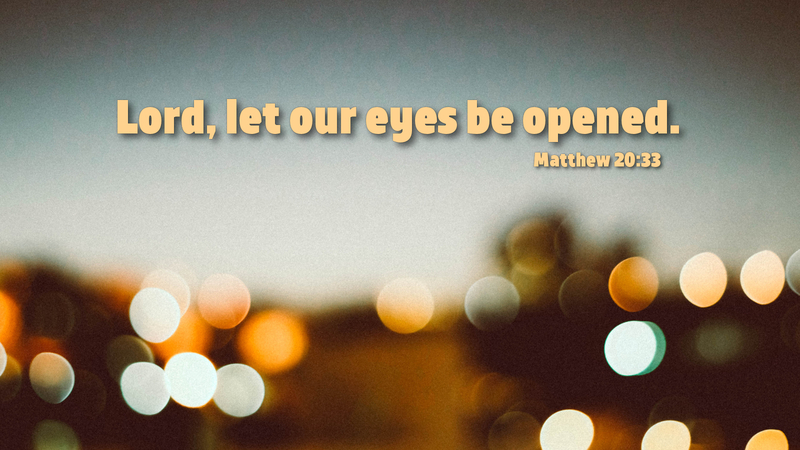 Two blind men were given their sight by Jesus. Matthew wrote that they heard Jesus was going by and, despite the crowds’ admonitions to be quiet, they shouted for his attention. There seemed to have been a vision on their part about Jesus, that he could and might help them. The passage states after they received their sight, they followed Jesus. We can only imagine the other wondrous things they observed. My great-grandfather was blind when I was born. His vision loss was due to the onset of diabetes. He and his wife bore thirteen children and they were all baptized and nurtured in the Christian faith. He carried his faithful vision forward with the hope of seeing all his loved ones in our Lord’s kingdom to come. He passed on a vision for his family and their many children to come. If you are familiar with Jesus Christ, you likely have a vision about him which you could express for the benefit others. Like those blind men whom the crowd sought to hush, perhaps you have been stifled about mentioning Jesus in the presence of others. Take their example to heart and speak out. Many will gratefully receive it. Prayer: Healing Lord of heaven, grant us a bold faith that we might proclaim the glorious and majestic name of Jesus Christ before those who are waiting to hear about you. Amen. As they called out that Christ was the “Son of David” their once mighty and Godly King, knowing of His miracles, they knew by faith that they also could be healed. How often do we go through life without sight because our faith is so weak? We have been taught that all the gifts of prophesy, healing, speaking in tongues, wisdom all died with the apostles, Why are we so weak today? How do we stop this trend that has been taught for so long?